In a world of skewed political games generations play, and the horror of the consequences, a remarkable group of university architecture students answered a call to collaboratively learn and work with counterparts 6000 miles away- to contest the political rhetoric, and imagine possibilities. 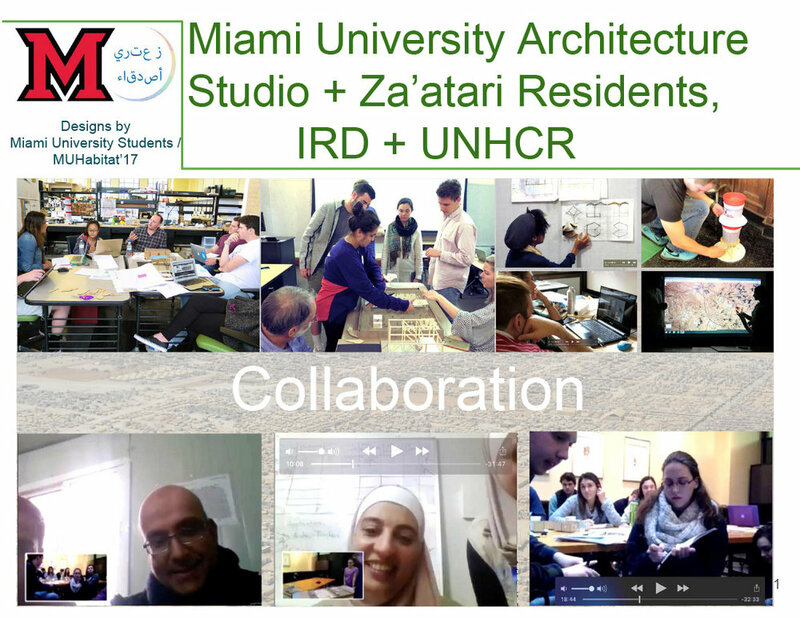 In 2016, and 2017, Miami University architecture students collaborated with current Syrian artists, engineers, residing in the Za'atari Refugee Camp in Jordan to design needed elements for the residents of Za'atari. Our work was facilitated by NGOs (2016-17 IRD, International Relief and Development), and the UNHCR. Using social media, primarily Skype, we collectively designed needed elements for Za'atari - bus shelters, furniture, transport vehicles using recycled material available in Za'atari. Our work was the catalyst for 14 bus shelters constructed along the Za'atari perimeter ring-road in the summer of 2016. In 2017, we addressed housing needs, boys and girls sports facilities, and themed community centers. In 2016, I traveled to Za'atari, and, again, in 2017 with a colleague and two former students to conduct multiple workshops with adults and children continuing the participatory design process. Our hope was to assist in establishing more livable spaces and conditions. Our collaboration changed many of us in the studio - events and people at a distance have become part of our lives in the everyday. We made new friends across cultural differences, connecting in ways we never thought possible. As the work continues, students are committed to design as a means to engage positive change through social justice concerns. A significant number of students continue this work as they journey personally and professionally. Our collective engagement, on both sides of the Atlantic, would not be possible without Miami University alumna, Laurie Balbo, (B.E.D1981) living in Jordan during our 2016 work, the support from department colleagues and the College of Creative Arts, Miami University, and the caring work conducted by NGO staff in Za'atari. The following are a few organizations making a difference. They need our help. Contact:Donate.